Principal Georgina Castilleja personifies a model school leader as she confidently crunches numbers in her office with a colleague. Within the hour, she cordially greets incoming Clifton Middle School sixth graders during their orientation. The graduate from Harris County Department of Education’s Principal Academy hit the ground running this July preparing for her first year as leader of the Houston ISD middle school. Meanwhile at HCDE, leaders of the principal academy are busy preparing for a new class of fall recruits. A recommendation from a friend last year led Castilleja to enroll in the HCDE program that prepares teachers to become certified school leaders. The hybrid program is both onsite and online as principal candidates meet once a month on weekends, combined with self-paced online assignments. To date, all students completing the program and taking the principal certification exam passed the test. Personalized leadership coaching and mentorship is delivered by a handful of educators who have a history of successful school leadership. Each alumni class is small, with customized attention. Castilleja immersed herself into education in an entry-level position as a school office clerk 17 years ago. She worked while going to college to become a reading and language arts teacher and then an ESL teacher. “I thought I’d be a teacher for the rest of my life, and in a way I feel that is still the case,” she said. “However, I felt my influence would have greater impact outside of the classroom. Maybe not greater (than a teacher), as the most significant influence is within the classroom, but perhaps a wider-reaching impact as I come into contact with more stakeholders,” Castilleja said. She says the HCDE leadership program forced her to step out of her comfort zone and explore different areas of school leadership, waters she had not tread before. During the past year the bilingual educator was assistant principal at Sharpstown High School on probationary status as she completed the HCDE Principal Academy. Leadership advancement coaches at HCDE, including veteran administrators Deirdre Sharkey Williams and Chaney Ledet, helped Castilleja along the way. During the year, Castilleja said she and fellow students benefitted from guest panel principals who shared their experiences. “One of those principals in the guest panel has now become a great mentor to me, and our first connection was on a Saturday at HCDE,” Castilleja said. As the 17-year educator now prepares to lead her school of 800-plus students by example, she envisions and prepares Clifton to be a welcoming environment for all stakeholders—the students, teachers, parents and volunteers. HCDE Principal Academy leader Zatopek beams as she recalls the growth she has seen in Castilleja, always a teacher but now a leader of her new community as principal. “We’ll always be here for her, anytime she needs it,” said Zatopek. For information about joining the “Lead Now” fall class of 2017 HCDE Principal Academy Cohort beginning Sept. 9, go to www.hcde-texas.org/leadnow or email hcdeacp@hcde-texas.org. 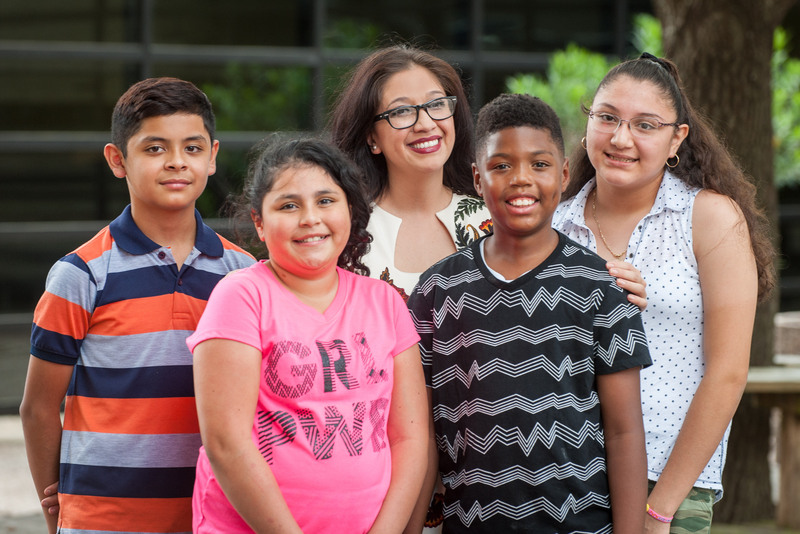 Photo: Harris County Department of Education Principal Academy graduate Georgina Castilleja meets with incoming sixth graders at Clifton Middle School in Houston ISD, where she is principal for the upcoming 2017-2018 school year. About Harris County Department of Education: HCDE provides special education, therapy services, early education, adult education and after-school programming. Services are funded by government grants, fees and a local property tax rate of $.0052. For every dollar in local property tax collected, HCDE provides $4.40 in services to the 25 Harris County school districts. HCDE also operates four campuses for students with profound special education needs and adjudicated youth who require a low student-teacher ratio and highly structured environment. One-hundred percent of students served on HCDE campuses are at-risk. The organization is governed by an elected board of seven trustees and has 1,060 employees and 33 facilities, including 15 Head Start centers. More info at www.hcde-texas.org .